Sherry Lee holds up a small outfit she made for Infants Remembered in Silence in her sewing room at her home on Tuesday evening. Lee said that she will sew at least five days a week for about 2-3 hours per night for IRIS. 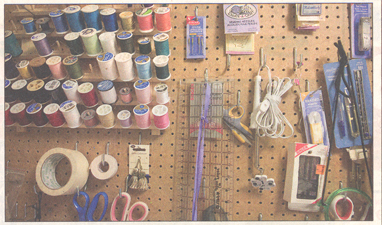 (Jackson Forderer/Daily News) Sherry Lee's wall is lined with thread and other tools needed for sewing outfits for Infants Remembered in Silence. Lee has volunteered for IRIS for about five years and said that she has made thousands of outfits for the organization. A prayer goes into every burial gown Sherry Lee sews for Infants Remembered In Silence Inc. (IRIS). "I say the prayer when I put the final bow on the gown," said the rural Faribault woman, who volunteers her time to sew the gowns. The burial gowns are offered by IRIS advocates to parents who lose a child in pregnancy or early infancy. "They can accept them or not," said Diana Sundwall, IRIS' executive director. "Many parents, however, are very grateful for the offer and accept them. A miscarriage, stillbirth or other reason for a baby's death is so sudden that parents have no idea what they want to do. What IRIS is about is offering them support and choices." Lee makes several hundred burial gowns a year for IRIS. She has been doing it for five years. "I started doing this because I had a loss of child in pregnancy quite a number of years ago and would have loved to have had the support of an organization like IRIS," Lee said. The outfits, while as small as doll clothes, are specially designed to fit infants lost in pregnancy or stillbirth. Some, however, are in larger sizes for infants born full-term, but die from illness or accident. "It's become a passion with me," Lee said. "It's like a hobby, but with a great purpose behind it." Lee's oldest daughter, Kelly Velander, was helping out with IRIS' summer golf tournament five years ago when she learned IRIS needed a volunteer willing to sew burial outfits. She volunteered Lee, who sews for a living at Professional Supplies Inc. of Faribault. "Sherry came along at just the right time," Sundwall said. 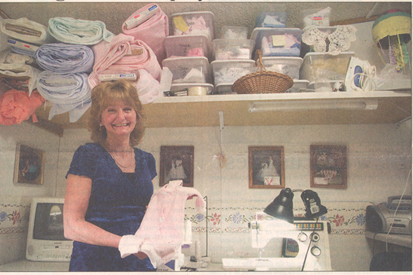 "Marilyn Borst, who had been sewing outfits for us, had passed away. We needed to find a volunteer to replace her. But it really needed to be someone with the talent to do it, like Sherry, and who had no problems with the idea of sewing burial gowns." Lee's younger daughter, Crystel Lee, 13, grew up helping out at IRIS fundraisers and activities because of her sister's and mother's involvement with the organization. "I think not enough people know about the organization, especially that it offers services to those who miscarry," Crystel Lee said. When Sundwall started IRIS 21 years ago, she hoped to help one family a year. Last year the organization assisted approximately 6,000 people in the six-county area it serves, that includes Rice and Steele counties. Just within the last three weeks, it has given away 50 bereavement packages of information to help families experiencing a loss of a child in pregnancy or early childhood, Sundwall said. Each packet costs $60, so that is a cost of $3,000. "It's great that we have volunteers like Sherry Lee, who sews burial gowns and donates them to the organization," Sundwall said. "But we have many other expenses, and estimate that our costs average around $500 for each family served, even with our many volunteers." Because of that, fundraising is vital to cover the nearly $70,000 spent by the organization to serve families and keep its office open at 101 NW Third St. in Faribault. This weekend's Family Fun Weekend is one of IRIS' biggest fundraisers of the year, netting around $15,000 last year between its three components. There is a Saturday night fun night for families at the Faribault Community Center costing just $10 per family; a $6 Sunday breakfast at the American Legion; and afternoon bingo at the Legion with a cost of just $1 per card. "We try to keep the cost of our activities reasonable so they are affordable to families," Sundwall said. "We estimate around 1,000 people participated in last year's family weekend events. We're hoping for a strong turnout again this year."